I’d be honest, I’m not a big clown fan. I think most of them look kinda freaky even if their funniness makes them easier to accept. Neither am I a big fan of snow and ice and all things ice related. I like living in the tropics, thank you very much. 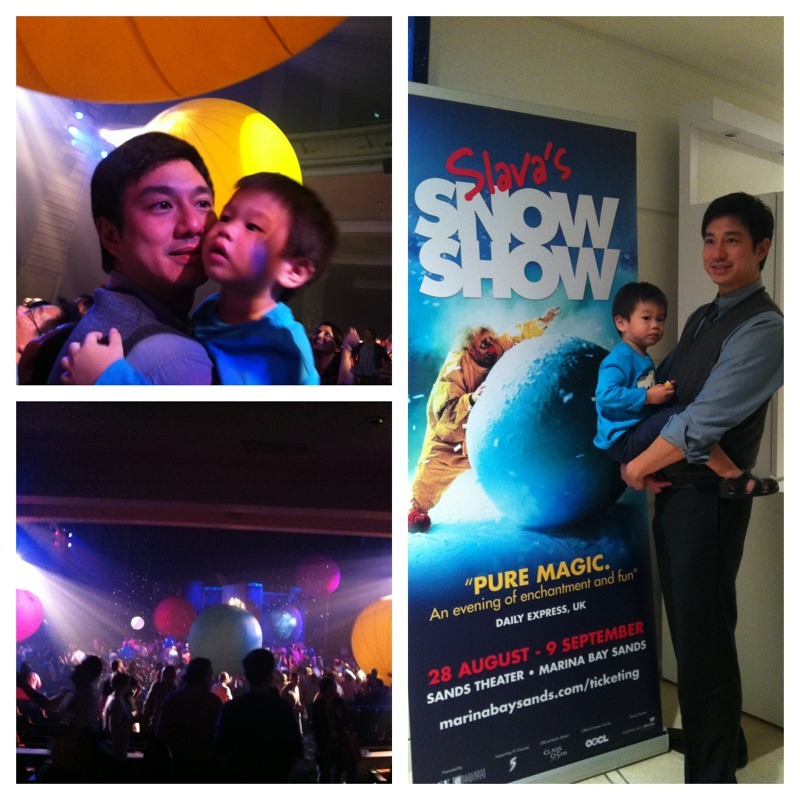 In any case, when we were invited to go catch Slava’s Snow Show when it came to town, I decided- heck, why not. But I’m packing me some warmer jackets and go with an open mind. The show started of a little late and, truth be told we weren’t feeling too optimistic about the show seeing as the Sands Theatre was hardly even full. There were more than a few bits of paper snow on the floor from previous shows so Q was kinda bummed that it wasn’t real snow. It was a little warm, the background “music” of trains chugging along was starting to grate on me. After a 15 minutes delay, the show finally took off and built momentum relatively slowly. We had to remind ourselves that this was not Cirque du Soleil even if the creator was with the troupe before. The clown work was funny enough, not particularly unique but more than competent and Q finally perked up with they hit the famous bubble show where thousands and thousands of bubbles floated about the stage. There wasn’t a clear flow of a story- not even sure if there was supposed to be a story back line but each individual segment was ok and the first half ended quite nicely with a screen of silk being pulled over the entire audience. Q was not impressed with this part seeing as the lead up to this was the clown cleaning “cob webs” and my 2m5yo decided it was dirty. Hahaha. The latter half of the show was significantly better that the former with more fast paced action and funnier clown plots. There was a lot more (paper) snow being dunked on the audience so that was quite fun for the kids who were there. We were lucky to sit at a sweet spot near the front where we were spared most of the water being splashed around and we got to play with the snow but not be a washed by it as some members of the audience did. The back half had a slightly freaky segment (think rocking horse, morose clown knitting in the former, white shape walking across the stage) which I found utterly unnecessary but what do I know about the fine art of clowning, right? The last two segments were the pinnacle of the show: a beautiful mime between a clown and “his lover” saying goodbye- beautifully executed and timed. That was followed by the legendary snowstorm which was absolutely spectacularly done. I’ve never been in a snowstorm and have no clue how accurate it was; but I liked that well enough. If you ask Q, though, he’d tell you he liked the ending best; when they threw HUGE balls into the audience. He tried to take a ball back but we wren’t allowed to- bummer. The show was pretty neat, all in all. A little pricy if you ask me, but quite fun overall. This entry was posted in Review, Show, Things to do and tagged clown, kids, Review, Show, slava's snow show, Theatre by matchingsocks. Bookmark the permalink.